There is no manufacturing information on the lid, but it looks and feels like the Corning manufactured in France. It measures 8 1/8 inches in width. 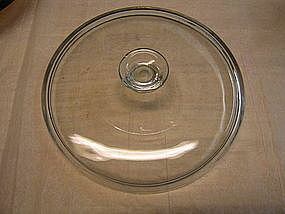 The rim is unusually made and "caps" down the bowl portion. There is no inner flange. It has no chips, cracks or breaks. The rim feels slightly rough in a couple of areas, not sure if it is from the manufacturer's mold or if actual damage. It is very slight and does not keep the lid from fitting. I will provide additional photos of the rim, to help in identification. I have it available in amber in the same size and design. I need your zip code to calculate the postage.